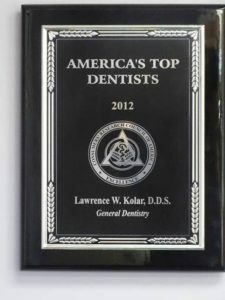 Dr. Lawrence W. Kolar is a board-certified dentist, licensed to practice general dentistry in the states of Illinois, Wisconsin, and Michigan. 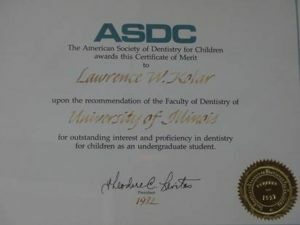 He graduated with honors from the University of Illinois in 1978 and earned his dental degree from the University of Illinois College of Dentistry in 1982. 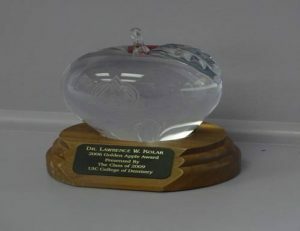 He received an award at graduation for Clinical Excellence in Pediatric Dentistry. Dr. Kolar is a member of the American Dental Association (ADA), the Illinois State Dental Society (ISDS) and the Chicago Dental Society (CDS). 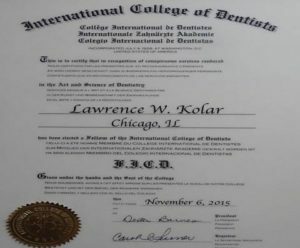 Dr. Kolar is one of the few practicing dentists who has extensive experience in both dental instruction (22 years at the University of Illinois College of Dentistry, including 5 years as a course director) and also as a dental licensing examiner (for the Illinois State Board of Dentistry). Dr. Kolar is also dedicated to maintaining and upgrading his clinical skills through continuing dental education classes. Each year, he takes between 35 and 50 hours of advanced training in clinical dentistry. This is in addition to presentations and lectures that he has given at local dental meetings. 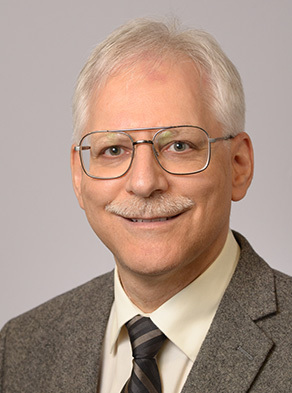 Dr. Kolar participates in clinical licensing examinations for dental students and recent dental graduates in numerous states (including Illinois) with the Central Regional Dental Testing Service (CRDTS) and the Commission on Dental Competency Assessments (CDCA). 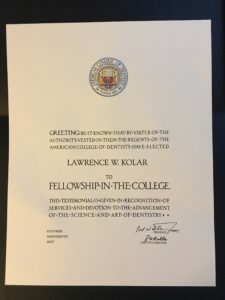 Although these examinations involve much traveling and time commitments, Dr. Kolar is firmly dedicated to the process of maintaining the accountability of dental schools and their graduating students for the betterment of the general public. 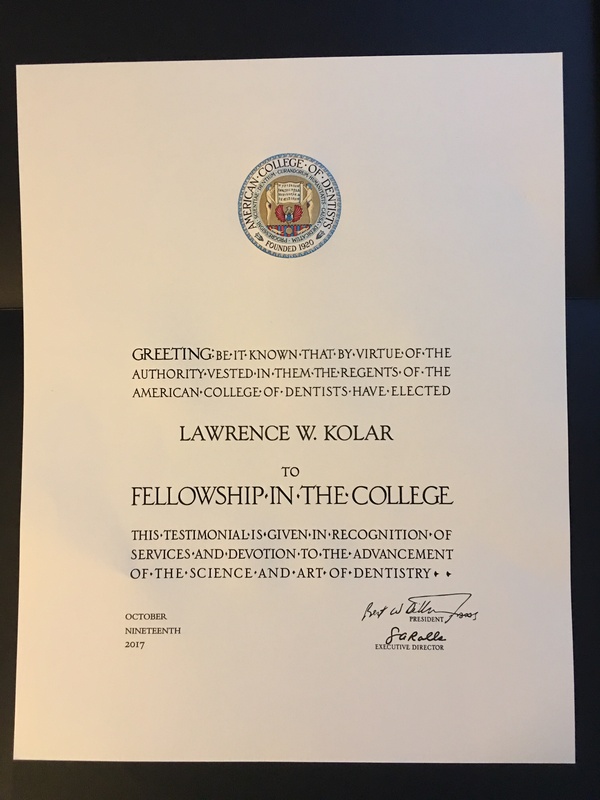 Also, Dr. Kolar believes that his work as a dental licensing examiner makes him a better dentist. 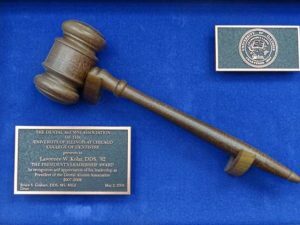 Dr. Kolar is a past president of the University of Illinois College of Dentistry Alumni Association. He has been inducted into the International College of Dentistry (ICD), which is an international honorary society of dentists. The ICD inducts members only by invitation, and has been described as the most prestigious honorary dental society in the world. Dr. Kolar’s practice philosophy is that dentistry is a healing science that focuses on the prevention of dental diseases, whenever possible, as well as the treatment of dental diseases. He has a particular interest in the relationship that dental disease has upon overall health, as well as the clinical modifications necessary to safely and effectively treat dental problems in medically compromised patients, especially in elderly patients. Dr. Kolar’s practice strongly emphasizes the “medical model” of dental practice. This is in contrast to many dental practices today, which treat mainly the “cosmetic” and “purely esthetic” aspects of dentistry. Dr. Kolar volunteers for local school band programs and assists with chaperone duty on trips. He also assists in parades and halftime shows by feeding the musicians and keeping them hydrated, as well as helping with any other tasks needed to ensure the program runs smoothly. To view Dr. Kolar’s full Curriculum Vitae and articles by Dr. Kolar, click here.